Welcome to a Camp that is built for your young Performer and Creator! 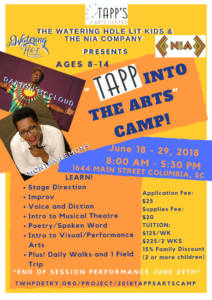 “Tapp Into The Arts” camp is focused on developing a love and passion for theatre, performance, poetry, writing, and all the arts! This is not an audition based camp. No experience necessary. TWH Lit Kids in collaboration with The NiA Company invites your child to a camp that will bring out the best artist in them. We will spend 2 weeks exploring all aspects of Arts and Theatre in a fun, exciting and supportive environment. NiA Company Creative Director Darion McCloud and his team of actors will be providing instructive, fun classes that focus on improv, stage direction, and performance techniques. Most importantly this class is focused on developing a love and passion for theatre. 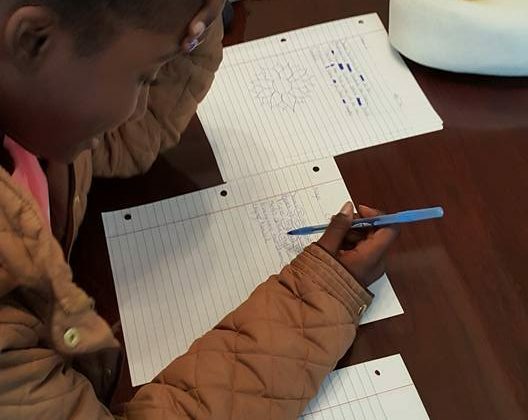 Monifa Lemons and The Watering Hole performance team will instruct in understanding and respond to narratives and ideas in both written (poetry and scriptwriting) and oral (recitation and performance) modes of communication. In addition, students who complete this program will be dynamic, confident, and excited creative writers and public speakers, who are able to pursue lifelong enjoyment of literature and theatre. We will close our camp with a performance that will spotlight on your child’s experience here at the Tapp’s Arts Center! This Camp will be a “Mindful Campus”, meaning we will be focusing on your Whole Child, accommodating for the healthiest lifestyle choices in mind, body, and soul. Your child will receive specialized arts education from professional instructors who work with 2 of the most celebrated arts organizations in the Midlands, The NiA Company and The Watering Hole Poetry Organization. Darion McCloud is a storyteller and has told for live, televised and radio audiences up and down the eastern coast for over fifteen years. 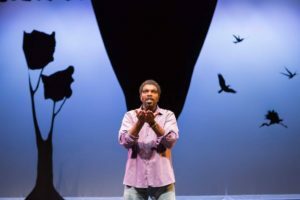 A veteran of stage Darion is also the Founder and Creative Director of the NiA Company a multi-ethnic critically acclaimed theatre group where he also acts and directs. He is also a former longtime company member with Trustus Theatre and the South Carolina Shakespeare Company. Darion also led the development of and is now the vice president of the Friends of African American Art and Culture membership affiliate of the Columbia Museum of Art. Monifa Lemons is the co-founder of the Watering Hole Poetry Collective, has been writing and performing poetry throughout the country from national stages to small venues. An artist, cultural entrepreneur, and mother, Ms. Lemons has forged a foundation of community, scholarship, and constructive critique for poets to advance the art form while making it accessible and keeping it relevant. Monifa is the Creative Director of The Watering Hole Lit Kids. 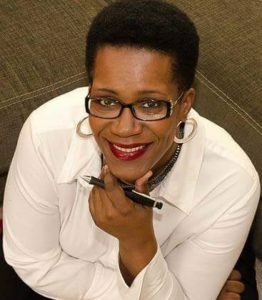 She has cultivated year long programming for TWH and continues to teach poetry and creative writing workshops for the Midlands Community. 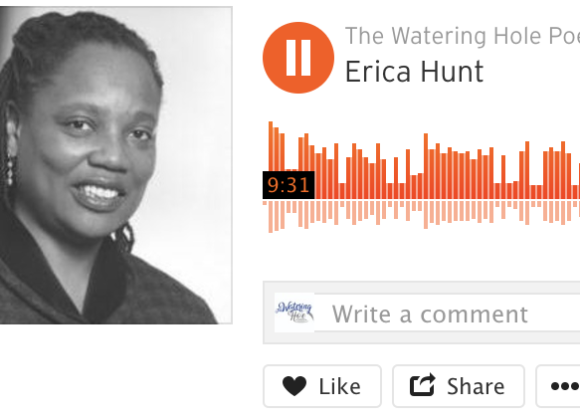 The Watering Hole In essence, TWH is a safe space for writers of color without regard for origin, age, gender, sexuality, varied abilities, or religion. In addition, we are equally a home for both written and spoken word artists–anyone who wants to grow in the craft. We provide affordable classes and retreats, swinging open the door for diverse forms of poetry, and pushing the bounds of a contemporary writing community. TWH Lit Kids is the Youth component of The Watering Hole Poetry Organization. Lit Kids uses social justice & arts activism as inspiration for urban youth to develop 21st century academic social & emotional skills. INSTRUCT INSTILL INSPIRE! NiA Company is a collective of art makers of different races, genders, politics, beliefs, sexual orientations and concerns who come together to make theatre that speaks with a human voice from a black soul touching hearts and minds of young and old, rich and poor the uninitiated and those in the know! South Carolina’s nomadic art heroes have been at it for more than twenty years performing and teaching on stages from Charleston’s Piccolo Spoleto to Charlotte’s Harvey B. Gantt Center of African American Art and Culture.